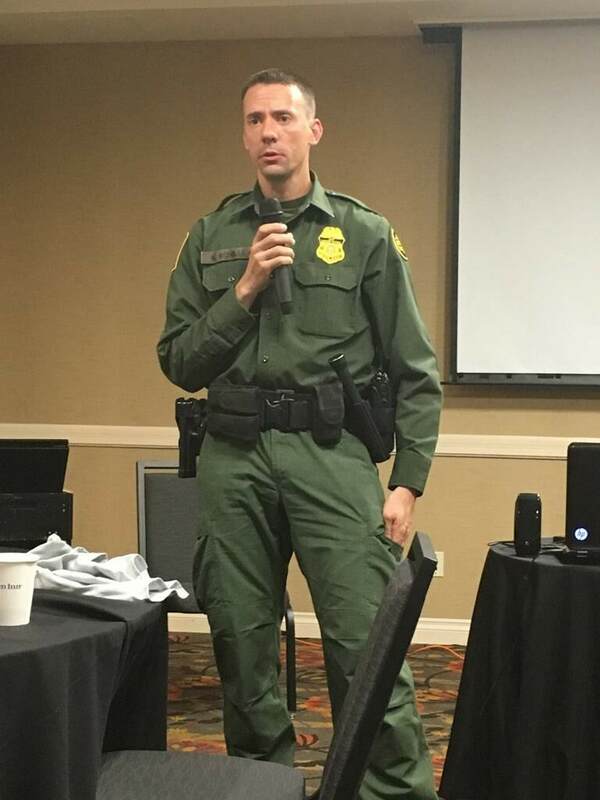 Robby Schiller and Ray Ocampo, U.S. Border Patrol Officers, to give us on-the-ground perspective and updates on a very hot topic throughout this decade, especially the past few years. 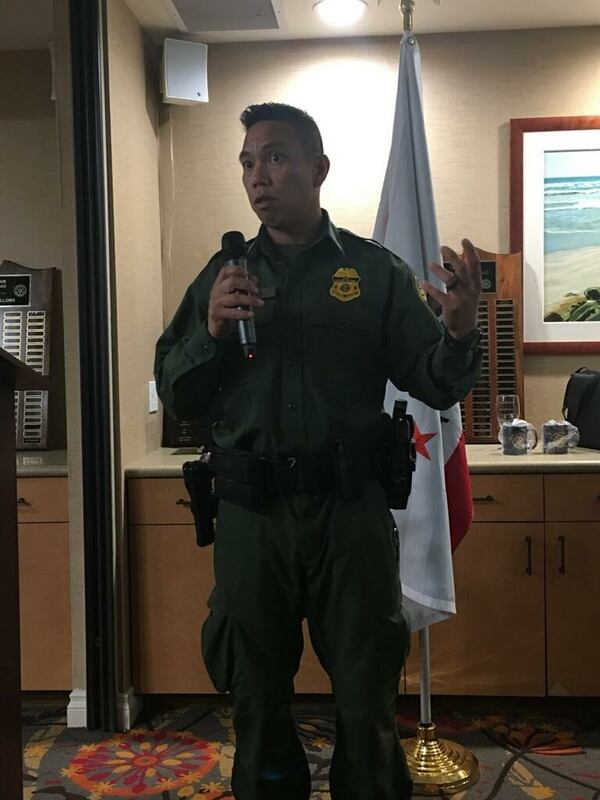 While Schiller’s love of hiking, tracking and his years as a Peace Corps volunteer in Namibia led to him joining the Border Patrol, Ocampo’s story touches the core of the debate: he is a naturalized U.S. citizen from the Philippines who came here as a young child, grew up in Chino Hills, became a citizen in 2010, and joined the Border Patrol. They began by showing a 20-minute video, “San Diego Sector: Then and Now.” You watch this and wonder, “We think today’s problems are bad?” We relived watching thousands of illegal immigrants walking or running on open freeways in the 1980s and 90s, flooding open ground now covered by the sprawling Los Americas mall, getting robbed or worse by bandits and coyotes, and overwhelming available forces. One statistic spells the difference between then and now: in 1986, there were 630,000 arrests along San Diego County’s 60-mile stretch of border. In 2017, that number was 26,026. The officers credited more manpower and the advent of great surveillance technology — underground sensors, stadium lighting, better primary and secondary fencing, quicker computer ID checks, cameras, and pursuit vehicles such as boats, Sea-Doos, ATVs and even more horses. The officers stated that, while illegal immigration is an everyday problem, the greater issue today is narcotics interdiction. Cartels continue to spend $1 to $2 million building tunnels, “an investment that is paid back by one good drug smuggle through that tunnel,” Ocampo said. Schiller added that the recent deployment of U.S. troops can be a good thing, since in their role as logistics supporters, they can push groups of migrants toward ports-of-entry, where they must go to request asylum — while also deterring traffickers. National backgrounds are broadening. Mexicans and nationals from the Northern Triangle — Honduras, El Salvador and Guatemala — make up most of those who cross the border. They’re now followed by South American nationals, then Vietnamese, Chinese, Indians, Nepalese and Pakistanis, their reasons for coming to the U.S. greatly different. “It’s complex,” Ocampo said. The two officers fielded a great line of questions from Rotary members covering these and other topics.